Our Youth Leagues are USBC Sanctioned during the fall/winter starts in September. We have great volunteer coaches who are on the lanes coaching your kids, teaching etiquette, sportsmanship and the skills required to be a good bowler. What makes our Youth leagues special? 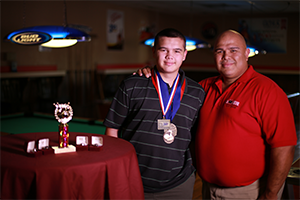 – Our youth league bowlers can participate in scholarship tournaments and earn money! – All our youth leagues are geared to be affordable, convenient and educational! Please feel free to contact us with questions or come try one out! We are also Proud to host Oklahoma High School Bowling at our facility. This is a great FREE program open to high school aged students who want to learn to bowl as a team. Tryouts are usually in November, then the team bowls Baker style format in competition until February when we bowl in a regional tournament. State tournament is the weekend following the regional every February. We currently have teams from Norman High, Norman North, Washington, Purcell, Noble and Blanchard schools. Please contact the bowling center closest to you if you have an interest in a high school bowling team. Tim Howard is our High School Bowling Coordinator. Oklahoma High School Bowling is an exciting way for high school students to compete in bowling. Our high school coaches work with teams from Norman High, Norman North, Washington & Noble area schools. Oklahoma High School Bowling is hosted and administered by the bowling centers and conference director. Tryouts are in November and the teams bowl and practice until a regional and state competition in February. High School Bowling is a FREE activity. Please call the bowling center and ask for Conference Coordinator Tim Howard for more information. Please call us for help with your scouting bowling badges, we have a program in place. The more the merrier so if you can combine troops or offer it to a whole CST or area we are happy to host all of you! There are so many ways to incorporate bowling into your Home School programming! From health and physical fitness, to etiquette, sportsmanship and scoring, bowling is a great activity for Home School families. It’s also very affordable for families who can visit during the daytime hours! Let Sooner Bowling Center help your Home School programs with bowling education. We have resources ready for you to use to incorporate bowling into your curriculum. No one sits on the bench with bowling! We can arrange a time that is convenient for your homeschool group to come out and enjoy the benefits of bowling.